Onions, Peppers, Green and Yellow Zucchini, all grilled to deliciousness, seasoned and wonderful to add to a pasta. You may recall a few weeks ago when I posted my version of a Summer Fresh Mint Basil Pesto recipe. Combine the grilled vegetables with the fresh made pesto and you have something amazing. Just simply a BIG BITE of Summer freshness! The inside work of boiling the pasta and mixing with the pesto is done in advance. Grilling and a quick rough chop of the vegetables only takes a few minutes (time to "rest" your meat before serving), making this combination of a starch and vegetables a perfect side dish to serve at any backyard BBQ. Prepare the Pasta according to package directions. Drain. Mix with Pesto while the pasta is still hot, pasta absorbs sauces best when hot. Prepare vegetables, slice and brush with Olive Oil, Salt and pepper seasoning. Dice into large bite size pieces. 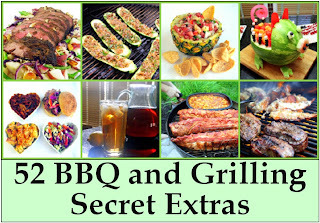 And if you liked this post, you will LOVE all the little extras I have all in one page... 52 (more actually)... 52 BBQ and Grilling Secret Extras. You Too can become MASTER OF YOUR DOMAIN (as long as your domain is your own backyard)! Be "That Guy" (or Gal) who does back yard open fire cooking just a bit better than the neighbors. It is the little things that will set you apart. 52 BBQ and GRILLING SECRET EXTRAS ... If you are a once a month (or summer) griller, these recipes and techniques are for you. New and simple dishes that will make you shine. If you cook often in a complex series of grills and dedicated smokers in an outdoor kitchen, I bet I still have a few dishes you can add to your repertoire. APPETIZERS, SIDE DISHES, CONDIMENTS, MAIN DISHES and even DESSERTS To MAKE you MASTER OF YOUR DOMAIN!!! I will be adding something new to the list (already above the 52, but still LOTS more coming). Best way to keep up is to "follow" my 52 Grilling Time Secrets Board on Pinterest. Anytime I have a new recipe for your grilling party I will add a pin. Thanks and I'll save a rib for you!